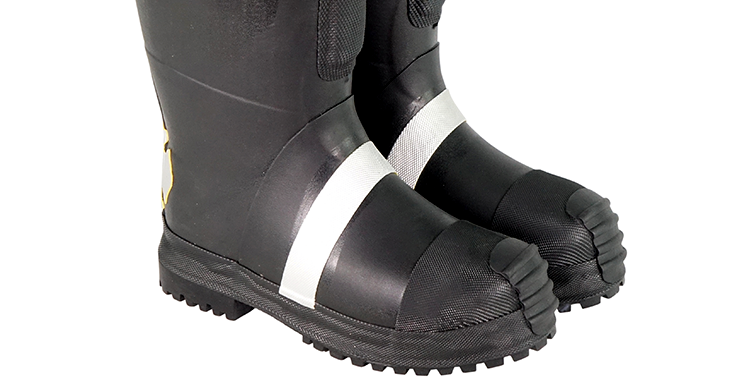 Enjoy superior protection and grip while fighting fires in these flame- and heat-resisting rubber light insulated structural bunker boots with lug sole. The stainless steel, puncture-resisting bottom plate provides a barrier between your feet and whatever you have to walk over to contain the fire. Experience added safety in the form of an oversized steel toe. And we haven't forgotten about your comfort, either. The 3.5mm polyester needled felt liner with heel reinforcement cradles your foot while your body fights the flames. Work on ladders without discomfort thanks to cushioned shin guards. Vulcanized construction guarantees a durable, shock-absorbing fit that won't melt or degrade in extreme heat or cold. Removable superknit-covered polyurethane insole absorbs shocks so you can stand against the flames in these NFPA boots for as long as it takes to contain the blaze. Available in whole and half sizes in 3 widths to ensure proper fit and comfort.